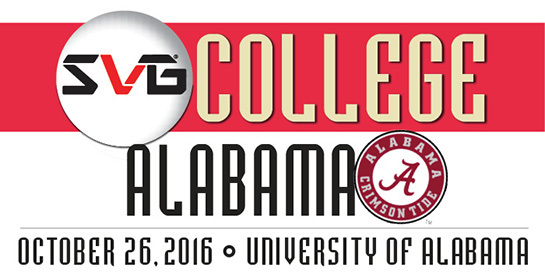 The latest in the SVG College Regional Event Series takes us to Tuscaloosa, Alabama and the University of Alabama on October 26 for SVG College: Alabama. Network with and learn from some of the top college sports video content creators in the area and become a part of the SVG College family. Registration is free for all college and university athletic department personnel. Students are welcome as guests of school staff members. Lunch will be served. Space is limited, so sign up today. Technology vendors: Only sponsors of the SVG College Initiative are welcome to attend. Follow SVG College on Twitter @SVGCollege. The SVG College Regional Event Series is a recurring series of half-day programs hosted on various campuses across the country that have demonstrated a commitment to and the investment in live video production. The shows are designed to bring together content creators and production technology specialists with some of the industry’s top technology vendors to discuss best practices for those at all levels of production expertise. Seasoned veterans share their experiences and help guide those looking to dive headfirst into the exciting world of video production in college athletics. The busy winter season is just around the corner and that means plenty of basketball live productions. Experts in live streaming discuss the latest in sports production technologies and strategies while helping you get the most out of your shows despite the size of your camera complement. Major social media platforms – such as Facebook, Twitter, Instagram, and SnapChat – have changed the game in video distribution. Hear success stories and best practices in live social streaming, as well as VOD strategies. Experts in live video production technology development share the latest in gear and offer tips on the best ways to improve your arsenal. Leaders from Alabama’s Crimson Tide Productions welcome attendees to their facility with a look at what makes the athletic department’s media arm so successful. Cap off a day of learning and networking with a behind-the-scenes, video tech-centric tour of the University of Alabama’s spectacular 46,000+-square-foot Digital Media Center in Bryant-Denny Stadium.